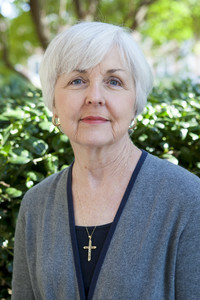 Joan Jackson owes much of longevity at Samford University to her son. As he was entering his senior year of high school in 1993, she decided she wanted to work at Samford because he wanted to attend. Her son eventually went on to graduate from McWhorter School of Pharmacy. In 1996, Jackson began taking classes through the adult studies program, ultimately receiving her undergraduate degree in 2005. "I have worked my entire 19 years at Samford in the pharmacy school and feel so blessed to have been a part of both the employee and student aspect of the university," she said. "As an employee, I feel the people with whom I work/serve through my position in continuing education have been an amazing blessing. I have made forever friends through this job."